The Arizona Technology Council is hosting its second Female Founders Forum (the brainchild of local entrepreneur Mary Juetten [founder of Traklight] and a small planning group) on the evening of Monday, August 17. This event is reserved exclusively for founders + entrepreneurs: this is not a generic women’s networking or educational event. The Female Founders Forum was designed to help attendees leverage the power of their connections and help each other solve burning issues to move these businesses forward. Come with your ONE issue or “ask” (you’ll be able to fill this out during registration online here) and leave with connections to a solution plus new additions to your network. We’ll have time at the beginning (and end) for networking, drinks and light food (all included in registration). We only have space for 50 entrepreneurs and are planning on selling out, so please register in advance (and early) if you plan on attending. Our event sponsor is Sherman & Howard, a national law firm that advises employers on all phases of the employment relationship, from application through termination, and on best practices concerning workplace policies, discipline, investigations, layoffs and reductions in force, and other employee relations issues. Sherman & Howard will kick-off the evening with a ten minute presentation to help entrepreneurs with an understanding of what their legal obligations are with respect to today’s management-side employment legal issues. 1. Learn about the differences between employees and “independent contractors” while understanding the latest trends and changes in the legal landscape with respect to the increasing uses of independent contractors. 2. 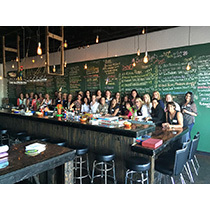 Meet close to 50 female entrepreneurs and share best practices and bring one “ask” that you need help with from the group. 3. Address how the DOL’s new proposed regulations for the overtime exemptions under the Fair Labor Standards Act for “white collar” employees may impact entrepreneurs and the independent contractor. 4. Know the risks of hiring unpaid interns and that employers should be aware that interns are not automatically excluded from coverage under the federal wage and hour laws, i.e., the Fair Labor Standards Act (“FLSA”). 5. Enjoy light appetizers from Postino and an amazing wine and craft beer selection from The Pig’s Meow while networking with your entrepreneurial peers. Cost: $40, includes two drinks + light appetizers. Again, please register in advance.